I got this recipe from another fellow Weight Watchers member who emailed me a whole collection of Weight Watchers recipes. I am so thankful she did! 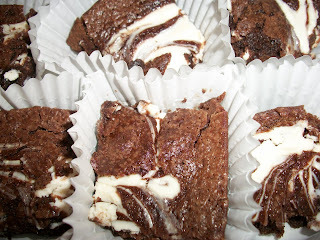 There were so many yummy recipes to choose from, so I settled on these cream cheese swirl brownies. These brownies are delicious, but I wish the serving sizes were larger. The more chocolate... the better. I guess I could eat two of them for 4 points, which is very tempting, but I won't or I will end up eating much more than two. Great recipe but small portions. I cut them into 16 squares and placed them in cupcake holders. Preheat oven to 350º F. Coat an 8-inch square pan with cooking spray. Combine flour, 3/4 cup of sugar, cocoa and baking powder in a medium-size bowl; mix well. Add canola oil, water and egg whites; mix just until dry ingredients are moistened. Spoon and spread batter evenly into prepared pan. Combine cream cheese, remaining sugar and vanilla in a small bowl; blend well. Drop small spoonfuls of cream cheese mixture over brownie batter; swirl gently with a knife to create a decorative pattern. Bake until toothpick inserted in center comes out clean, about 20 minutes. Allow to cool for 20 minutes before cutting into 16 bars.